Sign-up now - Get the lastest news and offers! Holiday cottages, bed & breakfast and renowned salmon and sea trout sport fishery in the heart of Cornwall. On our private forty-acre estate, nestled in the picturesque Camel Valley in North Cornwall, Butterwell Farm is a peaceful and idyllic location on the Camel Trail and Camel River perfectly situated between Cornwall’s North & South coasts. With our own private stretch of the River Camel, Butterwell offers a quiet oasis of abundant rare wildlife with direct access to the Camel Trail. The Camel Valley is regarded by many as one of the most unspoilt valleys in Cornwall. Enjoy woodland walks, wildlife ponds and exceptional game fishing on your front door, as well as many beautiful sandy beaches within a short drive. Whether it’s a family holiday, romantic getaway or a short-break with friends, Butterwell Farm has the perfect property for you. 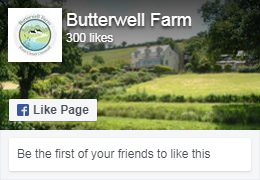 Butterwell Farm in the Camel Valley is a unique location which sees a great number of returning guests year on year. We consider this a testament to its wonderful charm and appeal. Copyright © Butterwell Farm 2018. Sign-up now - Get the latest News and Offers!